Maranatha had a new digital mission. 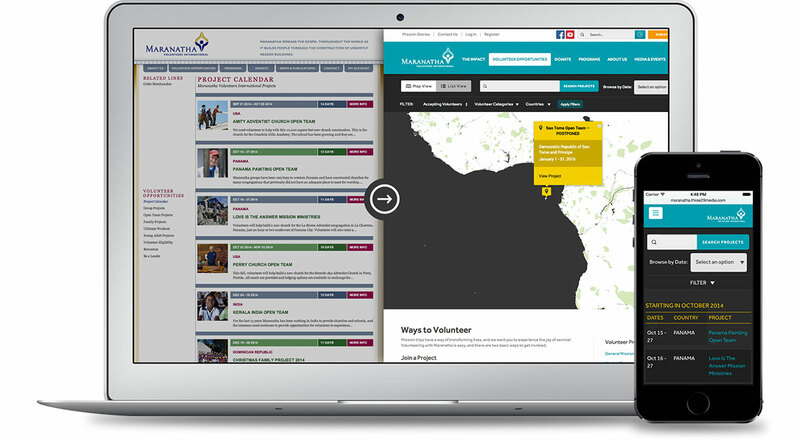 They were ready to harness the global power of their organization into a website that championed and more freely supported the work of their volunteers. The old Maranatha site needed a visual refresh, but it also needed a new color palette. The first step was to identify a more vibrant palette that could help Maranatha inspire. Maranatha is a huge organization, one of the largest volunteer organizations in the United States. Our strategic approach brought new content to the front and provided a solid foundation for growth. 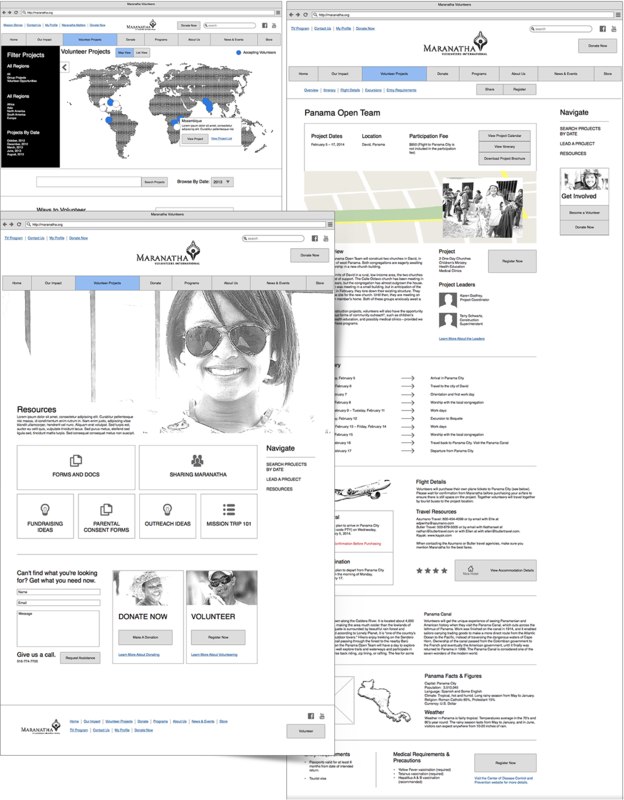 Strategy and colors in hand we dug into the UI/UX of the old site. Moving away from their static approach, their current site harnesses a dynamic page layout system that gives Maranatha literally thousands of page layout options. It all began with a pre-existing and wonderfully inspiring brand. We translated it into a lighthearted, kind, and joyful color scheme to communicate the essence of Maranatha’s team and their mission. Maranatha exists because of donations. This little orange button went through 4 rounds of revisions, color changes, size changes, and placements before final sign off. The point? Details matter, but the people and opportunity behind the details drives our work. 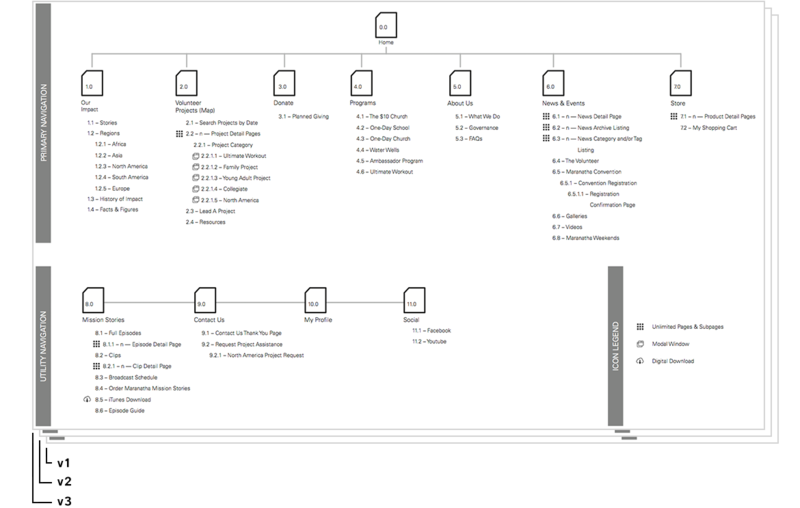 An intelligent strategy leveraging card sorts, sitemaps, and wireframes. How do you organize a non-profit the size of Maranatha? You break out the cards. Working as a team, each page of the Maranatha site was converted to a small card that could easily be moved, written-on, and organized. This simple but powerful strategy resulted in a completely new organization that was centered around the visitor, not Maranatha’s internal organization. A desktop and mobile UI/UX design refresh. We translated their old website into designs that could be consumed on the go. The Project Opportunities map not only experienced a major and dynamic upgrade, we designed it mobile-first. Signing up for a new project, whether you’re on your computer at home or browsing while in Panama, is now seamless and exciting. Maranatha is one of those projects that took on a life of its own, in a good way. The project was expanded multiple times during development to add even more functionality - we were initially tasked with design only and no build. The new site now integrates with internal systems, has a custom API, and a very powerful Google Maps integration. The team at Maranatha has been unbelievably fun to work with, bringing new ideas to the table, hearing our thoughts, understanding the value of good work, and partnering with us to develop new and exciting ways to display large amounts of information. The biggest take away we earned was that up-front specs are more important than ever when dealing with massive organizations like Maranatha. They understood that their project was changing, and because of the rappart we were able to establish, we made sure they walked away with a project that was exactly right, as opposed to under-budget. Maranatha also showed us what we can do when we put our heads together and dig in. At times the project took over Three29. Multiple designers and developers all cranking away on graphics and code; seamlessly passing materials between our staff and Maranatha’s. Projects like Maranatha show us what Three29 can be when pushed to our limits. And what are we when pushed? We are absolutely incredible!